A sketch of the hanging icon screen proposed for St Patrick’s, Hove. This proposed screen would serve to mark-out the sanctuary area. At the same time, and in a sense, more importantly, it would serve to reveal (on its inner surface) something of the focus and goal of our worship—and of our life on earth; and (on its outer surface) something of the means by which that goal, that final fulfillment was won for us. At the Eastern end of of the inner surface of the icon screen, and as focus for worship is an icon of Christ in glory. 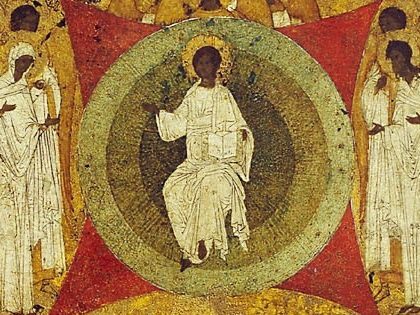 Around the rest of the inner surface are the saints (“a great cloud of witnesses”; see Heb 12:1), all orientated towards the Christ figure. The screen would be co-ordinated with icons of the Incarnation (i.e., the infant Christ and the Theotokos) and Christ the Word. Across the four inner corners are icons of angels and archangels. Obliquely, angled across the outer corners are icons of the four evangelists. The rest of the outer surface is covered with icons depicting the saving events in and through which Christ’s work was accomplished and man’s redemption won. Most importantly, across the front of the screen the paschal mystery is presented. A large crucifix is central. To the left are icons of the Crucifixion and Deposition; to the right, icons of the Decent and of the myrrh-bearing women at the empty tomb. As an extra I envisaged see large bowls of incense burning in bronze bowls on metre-high stands below each corner of the screen, giving the effect, I’d hope, of pillars of incense holding up the screen and of the heavenly and earthly realms being linked (cf. Rev 5:8; 8:3–4).